Back in 2004 Southampton went to Stanford Bridge to score one of the fastest goals in Premier League history, and as we all know, Asmir Begovic has planted one past Saints in 13 seconds this very season. On that basis, it wasn’t wise to miss the kick off as Saints took on Chelsea, especially with tickets priced at over 50p per minute, and a ring rusty Michael Essien keen to give his keeper an early touch. At least you have to assume that was what he intended, but a long range backpass only set up Rodriguez for an easy goal, that also ended up being timed at 13 seconds. Struggling Saints never looked like holding on to the lead that a spectacular James Beattie strike gave them in 2004, but the current squad have the defensive know-how to cope, and things were still looking promising at half time, albeit thanks to a fine save by Boruc from Torres. The Special One introduced Ba for Essien at the break, suggesting a renewed attacking intent from the home side, but Saints were coping until a 54th minute corner proved their undoing – a header from Ivanovic was turned onto the post by Ba and Cahill guided in a close range header. 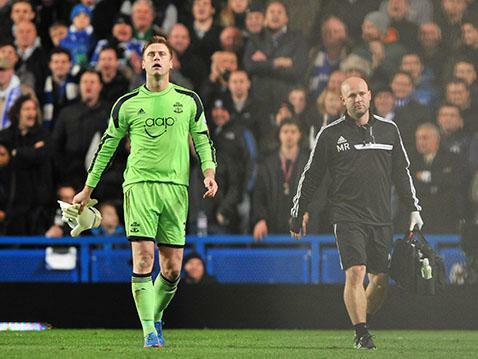 The last month or so has shown that the hitherto impeccable Boruc has feet of clay, but unfortunately he also has hands of glass, and a collision with the post and/or netting as the goal was scored left him with an injured finger. Whether his positioning would have been more effective than Gazzaniga’s as Terry headed Chelsea ahead soon after, we’ll never know, just as we won’t know whether the introduction of Lambert alongside both Rodriguez and Osvaldo was really the best use of resources. Saints never managed to trouble Cech, but they did force some corners, and they do have a track record in that department this year. However, just as an encouraging 6 minutes of injury time were about to be signalled, Ba beat Gazzaniga at the near post, and all the remaining action was purely academic. LSSC Man of the Match: Dejan Lovren. I don’t suppose you can really blame the centre backs when their opposite numbers score twice?